Good morning everyone, and a happy 4th of July to you all! Today we celebrate, our Independence Day, and I prefer to start out that celebration with a little wakey whiskey (hashtag wakeywhiskey) before I get into the BBQ and beer. My lovely wife Mandi recently made a trip out to Las Vegas and she was awesome enough to bring back a bottle of whiskey for me, so that's my selection for this morning. 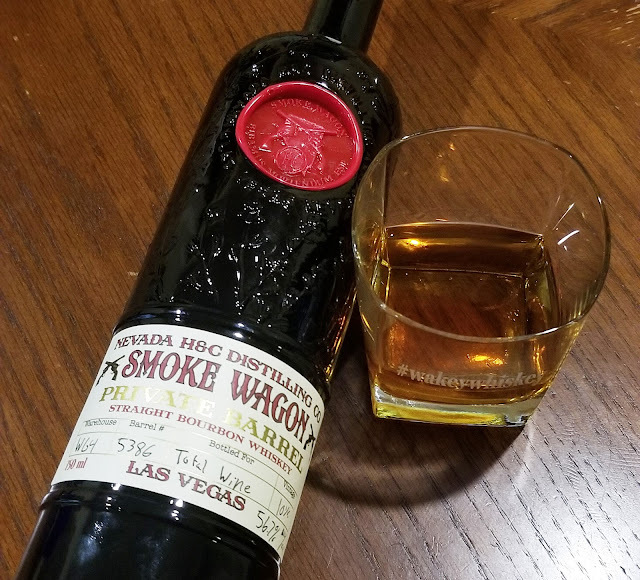 This is the Smoke Wagon Private Barrel Straight Bourbon Whiskey by Nevada H&C Distilling Co. They actually source their bourbon from Indiana (not uncommon), but my understanding is that they do all of the barrel aging and blending in house in Las Vegas, in addition to distilling vodka. This particular bottle is one that they aged for 10 years in a private barrel release for the Total Wine & Spirits near where my mother in law lives. It's bottled at barrel strength, in this case 56.7% which equates to 113.4 proof. Although not necessarily THIS barrel, their private barrel series won a double gold medal at the 2017 San Francisco World Spirits Competition. In addition to the private barrel line, Nevada H&C puts out an Uncut and Unfiltered version which is basically a barrel strength bourbon but blended from several vintages of barrel instead of being a single barrel. They also put out a Small Batch rye-heavy bourbon at 100 proof and the aforementioned Silver Dollar American Vodka. Enough about the company though, how's the bourbon? My initial thought was that this is a little on the harsh side, but it is a high proof bourbon, so I added an ice sphere (they ever recommend it on their website) and the whiskey opened up to me. Once that little bit of chill and water was introduced the bourbon started really showing strong oak, vanilla, and chocolate notes, and the harshness turned into a pleasant alcohol presence. It's amazing to me how some whiskeys can taste watered down while others really open up, but the main thing I think is just drink it however you like it the best. Cheers to you all, and I hope everyone has a fantastic 4th of July!